An in-depth report on the causes, diagnosis, and treatment of non-Hodgkin's lymphoma. The non-Hodgkin's lymphomas (NHL) are a group of cancers that develop in the body's lymphatic system. There are many different types of NHL. Most types of NHL involve B cells, while a small percentage involve T cells and rarely NK cells. Common types of B-cell NHL include diffuse large B-cell lymphoma (DLBCL) and follicular lymphoma. NHL are classified as indolent (slow-growing) or aggressive (fast-growing). Aggressive lymphomas, such as DLBCL, are often curable. Indolent lymphomas, such as follicular lymphoma, are more difficult to treat and tend to recur after periods of remission. With the advancement of new treatments and drugs, survival rates for people with NHL have significantly improved. The risk of NHL increases with age. Most people are diagnosed when they are in their 60s and 70s. However, NHL can develop in people of any age, including children. People who have immune system impairment because of infections, disease, or exposure to certain types of chemicals appear to have increased risk. Still, people without any known risk factors can develop NHL. The most common first sign of lymphomas is painless enlargement of one or more lymph nodes, usually in the neck, armpits, or groin. NHL is diagnosed based on the results of physical examination, blood tests, imaging tests, and biopsy. A lymph node biopsy is the definitive test for diagnosing NHL, determining the type of NHL, and distinguishing NHL from Hodgkin lymphoma. Radiation, chemotherapy, monoclonal antibodies (such as rituximab, or Rituxan), and targeted therapies are the main treatments for NHL. For some patients, stem cell transplantation may be an option. Recently, new chimeric T cell receptor (CAR-T) therapies such as or tisagenlecleucel (Kymriah) and axicabtagene ciloleucel (Yescarta) have been approved by the US Food and Drug Administration (FDA) for adults with certain types of NHL. Lymphomas are malignancies of the lymph system that are generally subdivided into two groups: Hodgkin's lymphoma and non-Hodgkin lymphoma (NHL). Hodgkin lymphoma accounts for about 10% of all lymphomas, and NHL for the remaining 90% of lymphomas. NHL is a term for malignancies that range from a very slow disease to an extremely aggressive but curable condition. They have certain features in common. 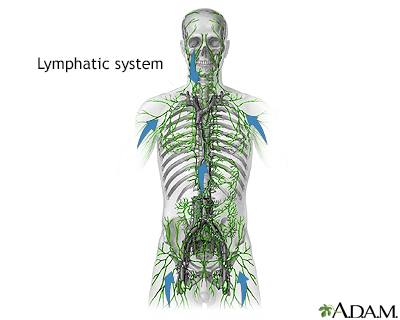 The lymphatic system filters fluid from around cells. It is an important part of the immune system. 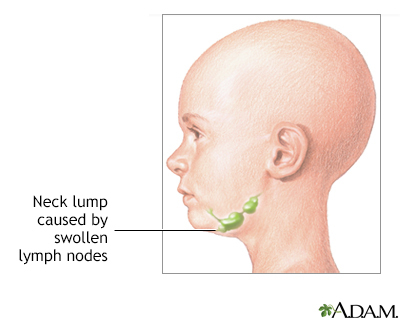 When people say they have swollen glands in the neck, they are usually referring to enlarged lymph nodes. Common areas where lymph nodes can be easily felt, particularly if they are enlarged, include the groin, armpits (axilla), above the clavicle (supraclavicular), in the neck (cervical), and the back of the head just above hairline (occipital). , important white blood cells involved in defending the body against infectious organisms. (thymus gland-derived cells). They are transported throughout the body via blood. Lymphatic vessels begin as tiny tubes transporting interstitial fluid away from tissues. These vessels lead to larger lymphatic ducts and branches traveling toward the heart until they drain into two ducts in the neck, where the lymph enters the bloodstream. , oval structures composed of lymph vessels, connective tissue, and white blood cells. Here, lymphocytes are either filtered out or added to the contents of the node. Both leukemia and lymphomas (Hodgkin lymphoma and NHL) are cancers of leukocytes (white blood cells). The difference is that leukemia starts in the bone marrow while lymphomas originate in lymph nodes and then spread to the bone marrow or other organs. In lymph nodes, lymphocytes receive their initial exposure to foreign substances (antigens), such as bacteria or other microorganisms. This exposure activates the lymphocytes to produce antibodies, which are immune system factors that target and attack specific foreign proteins (antigens). The size of a lymph node varies from that of a pinhead to a bean. Most nodes are in clusters located throughout the body. Important node clusters are found in the neck, armpit, and groin. The tonsils and adenoids are secondary organs composed of masses of lymph tissue that also play a role in the lymphatic system. The spleen is another important organ that processes lymphocytes from incoming blood. NHL occur most often in lymph nodes in the chest, neck, abdomen, tonsils, and the skin. NHL may also develop in sites other than lymph nodes such as the digestive tract, central nervous system, and around the tonsils. (fast-growing). Indolent and aggressive lymphomas are equally common in adults. Aggressive lymphomas are more common in children. Aggressive lymphomas tend to be more curable than indolent lymphomas. B cell or T cell. About 85% to 90% of NHL are B-cell subtypes, 10% to 15% are T-cell subtypes, and less than 1% are NK-cell lymphomas. This report focuses on B-cell lymphomas. The following are common types of B-cell lymphoma. DLBCL is the most common type of NHL, accounting for about 30% of all NHL cases. It is an aggressive, fast-growing lymphoma that usually affects adults but can also occur in children. 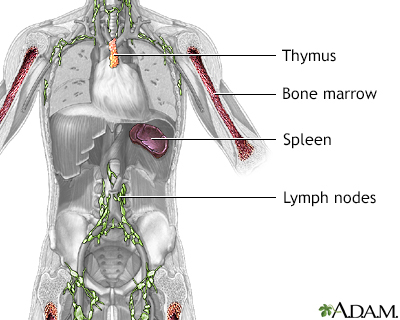 DLBCL can occur in lymph nodes or in organs outside of the lymphatic system. DLBCL includes several subtypes such as mediastinal large B-cell lymphoma, intravascular large B-cell lymphoma, and primary effusion lymphoma. FL is the 2nd most common type of lymphoma, accounting for about 20% of all NHL cases. It is usually indolent (slow growing), but about 20% to 50% of FLs transform over time into the aggressive DLBCL. Mantle cell lymphoma is an aggressive type of lymphoma that represents about 7% of NHL cases. It can be a difficult type of lymphoma to treat. It is found in lymph nodes, the spleen, bone marrow, and gastrointestinal system. Mantle cell lymphoma usually develops in men over age 60 years. SLL is an indolent type of lymphoma that is closely related to B-cell chronic lymphocytic leukemia (CLL). It accounts for about 5% of NHL cases. MZLs are categorized depending on where the lymphoma is located. Mucosa-associated lymphoid tissue (MALT) lymphomas usually involve the gastrointestinal tract, thyroid, lungs, saliva glands, or skin. MALT is often associated with a history of an autoimmune disorder (such as Sjögren syndrome in the salivary glands or Hashimoto's thyroiditis in the thyroid gland). MALT is also associated with bacterial infection in the stomach (H pylori) and can be potentially cured by antibiotics when treated in its early stages. Splenic marginal zone lymphoma affects the spleen, blood, and bone marrow. Nodal marginal zone B-cell lymphoma is a rare type of indolent lymphoma that involves the lymph nodes. Lymphoplasmacytic lymphoma, also called Waldenstrom's macroglobulinemia or immunocytoma, is a rare type of lymphoma accounting for about 1% of NHL cases. It usually affects older adults and most often involves bone marrow, lymph nodes, and spleen. This lymphoma affects the brain and spinal cord. Although it is generally rare, it is more common in people who have AIDS. Burkitt's lymphoma is one of the most common types of childhood NHL, accounting for about 40% of NHL pediatric cases in the United States. It usually starts in the abdomen and spreads to other organs, including the brain. A specific type of Burkitt's lymphoma that typically occurs in African children often involves facial bones and is associated with Epstein-Barr virus (EBV) infection. This lymphoma is more common in children, accounting for about 25% of NHL pediatric cases, most often boys. It is associated with a large mediastinal mass (occurring in chest cavity between the lungs) and carries a high risk for spreading to bone marrow, the brain, and other lymph nodes. NHL accounts for about 4% of all cancers in the United States. Each year, over 70,000 Americans are diagnosed with NHLs, and an estimated 20,000 people die of the disease. Since the 1970s, NHL incidence rates have doubled. Part of the reason for this dramatic rise may be due to AIDS, which increases the risk for aggressive lymphomas. The cause of NHL is unknown, but certain factors may increase a person's risk of developing this cancer. NHL can develop in people of all ages, including children, but it is most common in adults. The most common types of NHL usually appear in people in their 60s and 70s. NHL is more common in men than women. In the United States, NHL is the sixth most common cancer in men, and the seventh most common cancer in women. Overall, the risk for NHL is slightly higher in Caucasians than in African-Americans and Asian Americans. People who have close family relatives with a history of NHL may be at increased risk for this cancer. However, no definitive hereditary or genetic link has been established. EBV, the cause of mononucleosis, is highly associated with one type of Burkitt's lymphoma and with NHLs linked to immunodeficiency diseases. It is also a risk factor for Hodgkin disease. The human immunodeficiency virus (HIV), which causes AIDS, increases the risk for Burkitt's lymphoma and DLBCL. The hepatitis C virus (HCV) may increase the risk for certain types of lymphomas. HIV-positive patients and those with full-blown AIDS are at higher risk for NHL, and the disease is more likely to be widespread in these people than in those without it. Most AIDS-related NHLs are high-grade lymphomas. People who have organ transplants are at higher risk for NHL, probably due to multiple factors, including the drugs used to suppress the immune system and the transplanted organ itself. People who have had high-dose chemotherapy and stem-cell transplantation are at higher risk. People with a history of autoimmune diseases, including rheumatoid arthritis (RA), systemic lupus erythematosus, Hashimoto's thyroiditis, Crohn disease, and Sjögren syndrome, are at an increased risk for certain NHLs, such as MZLs. Overexposure to a number of industrial and agricultural chemicals (such as pesticides, herbicides, and petrochemicals) has been linked to an increased risk for lymphomas. The data, however, are not consistent. Researchers are investigating whether some chemotherapy drugs may increase the risk for later developing NHL. At this point, it is not clear whether it is these drugs or the other cancers themselves that increase risk. Other types of drugs, such as tumor necrosis factor (TNF) inhibitors that are used to treat autoimmune disorders, are also being studied as possible risk factors for lymphomas. People who have had radiation treatment for cancers such as Hodgkin's disease appear to have an increased risk for later developing NHLs. The risk may be higher for people treated with both chemotherapy and radiation. Survivors of nuclear reactor disasters have an increased risk of developing NHL, as well as other types of cancers. Lifestyle does not seem to be a major risk factor for NHL. Some studies have suggested that obesity may increase risk, but this association is not definite. Other studies have investigated the role of diet. Although some research has indicated an increased risk for diets high in consumption of red meat and lower risk for diets high in vegetables, the association remains speculative. There is no evidence that smoking increases the risk for NHL itself, although it has been linked with high-grade and follicular NHLs in people with lymphoma. The most common first sign of lymphoma is painless enlargement of one or more lymph node, usually in the neck, armpits, or groin. These enlarged lymph nodes may cause discomfort depending on where they are located. For example, abdominal tumors may cause stomach distention or pain, while lymph nodes in the chest may cause coughing or difficulty breathing. People should see their doctors if these symptoms do not go away within 2 to 3 weeks. Sometimes people with NHL do not experience any symptoms, or symptoms may not appear until the cancer is very advanced. Enlarged lymph nodes can also be caused by many noncancerous conditions, such as infections. 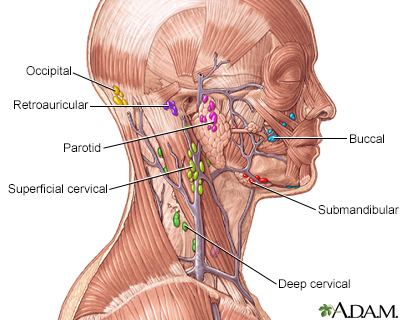 The most common lumps or swellings in the neck are enlarged lymph nodes. They can be caused by bacterial or viral infections, cancer, and other rare causes. Lymphomas sometimes cause systemic symptoms -- symptoms that affect the whole body, rather than a specific location. Some systemic generalized symptoms are referred to as B symptoms. People who have B symptoms have a more severe condition than asymptomatic people with the same cancer stage or tumor location or size. The health care provider will first ask questions about the person's medical history and perform a physical examination to detect any node enlargements. If these procedures indicate lymphoma, additional tests will be done to rule out other diseases or to confirm the diagnosis and extent of the lymphoma. The doctor will examine not only the affected lymph nodes but also the surrounding tissues and other lymph node areas for signs of infection, skin injuries, or tumors. The consistency of the node sometimes indicates certain conditions. For example, a stony, hard node is often a sign of cancer, usually one that has metastasized (spread to another part of the body). A firm, rubbery node may indicate lymphoma. Soft tender nodes suggest infection or inflammatory conditions. The type of biopsy performed depends in part on the location and accessibility of the lymph node. The doctor may surgically remove the entire lymph node (excisional biopsy) or a small part of it (incisional biopsy). In some cases, the doctor may use fine needle aspiration to withdraw a small amount of tissue from the lymph node. Even if the biopsy appears normal, in some cases the disease may still be present. The provider should continue to observe the patient until swelling or other signs of disease are gone. Biopsied tissue samples should be frozen in case special tests are later required. These tests are used to detect specific antibodies, genetic and immune factors, and certain markers (substances that may indicate disease) located on the surface of the cells. If lymphoma has been diagnosed, the tissue will be examined for its histology, the cellular structures that determine the lymphoma type. Bone marrow aspirate and biopsy are routinely performed to determine whether the disease has spread. 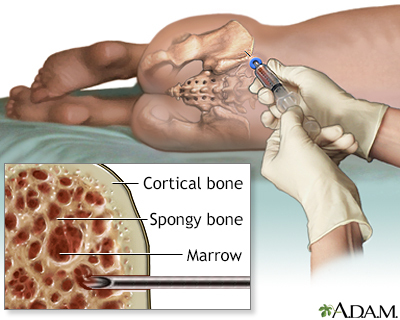 With bone marrow aspirate, bone marrow cells are sucked out through a special needle. A biopsy may be performed before or after the aspiration. In this procedure, a special needle removes a core of the marrow that is structurally intact. CT scans can detect abnormalities in the chest and neck area, as well as revealing the extent of the cancer and whether it has spread. CT scans are used to evaluate symptoms and help diagnose lymphomas, help with staging of the disease, monitor response to treatment, and evaluate symptoms. 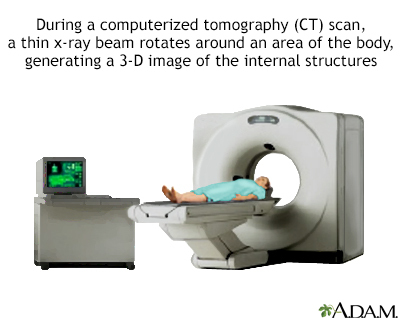 A CT scan is also often used to detect lymphomas in the abdominal and pelvic areas, the brain, and the chest. 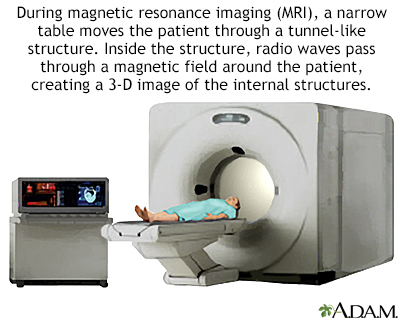 MRIs may be used to detect the spread of the disease to the brain, spine, chest, pelvis, and abdomen. PET scans can help predict whether an enlarged lymph node is benign or cancerous. PET scans are more accurate than CT scans or other imaging tests for staging lymphomas. PET scans may also help providers determine how well a person has responded to treatment, if any residual cancer exists, and if a person has achieved remission. Blood tests help rule out infection and other diseases. Such tests include a complete blood count to measure the number of white blood cells. In a person already diagnosed with lymphoma, blood tests that measure the enzyme lactate dehydrogenase (LDH) are important in determining the prognosis of people with fast-growing lymphomas. High levels indicate bulkier tumors. Tests of lymphoma's DNA are in use or are being developed to detect particular gene defects that help determine prognosis and response to treatment. Examples of such abnormal genetic arrangements are those that affect normal cell death, resist chemotherapy, or trigger aggressive cancer growth. Because so many different factors affect survival, it is difficult to make general statements about prognosis. For example, people with very slow growing (indolent) lymphomas can live many years. However, they are usually diagnosed at a late stage, after the cancer has spread, which gives a poorer outlook. Without treatment, aggressive lymphomas are more likely to cause early death, but they are also often curable. In fact, aggressive lymphomas usually have better chances for cure than indolent lymphomas. Survival rates for people with all types of NHL have greatly improved since the early 1990s, particularly for people under age 45 years. Advances in treatment have contributed to this improvement. FLs, the most common indolent (slow-growing) NHLs, are potentially curable in early stages I and II. Unfortunately, these slow-growing malignancies may not produce symptoms until they are in advanced stages. In most cases, these lymphomas are not diagnosed until they have spread to other sites, including the spleen and bone marrow. In such cases, they are difficult to cure. Predicting outcome for indolent FLs is more difficult than for aggressive lymphomas. Even if treatment achieves a response, these tumors almost always recur. Even after relapse, however, the tumors can be treated again if they are still very slow growing. In general, the average survival rate for FL is 7 to 10 years after diagnosis, depending on other risk factors. New drug treatments, particularly monoclonal antibodies (MAbs), have significantly improved survival rates. High-grade aggressive lymphomas are often symptomatic early on and are potentially curable with aggressive treatments. DLBLC, the most common aggressive NHLs, while fatal if not treated, is often curable with intensive chemotherapy combinations. If relapse occurs after chemotherapy, it usually does so within 2 years. Most other aggressive lymphomas respond to aggressive chemotherapy. Some aggressive lymphomas, such as mantle cell lymphoma, are sometimes less responsive to standard chemotherapy. Having one or none of these risk factors indicates the best outlook. Two factors indicate a low-to-intermediate likelihood of a poor outlook. Three factors predict an intermediate-to-high likelihood of poor outlooks. Finally, 4 or 5 factors pose the highest likelihood of poor survival. However, the International Prognostic Index was developed before the introduction of newer drug therapies like rituximab, which has dramatically improved the outcome of people with DLBCL. A newer version of the index has been developed since the use of rituximab became more widespread. A similar prognostic index is used for FL. The radiation and chemotherapy treatments used for treating NHL can potentially have long-term effects on many organs in the body and can increase the risk for serious illnesses, including heart disease and certain cancers. Other long-term effects of cancer treatments include somatic symptoms such as fatigue and generalized aches and pains. Some cancer treatments can cause infertility. People who may wish to have children in the future should ask their providers about fertility-preserving treatments. It is very important to have these discussions before cancer treatment starts. The American Society for Clinical Oncology (ASCO) has guidelines for the best fertility preservation methods for male and female cancer people. They include sperm freezing and banking (sperm cryopreservation) for men, and egg (oocyte) and embryo cryopreservation for women. In Stage I (early disease), lymphoma is found in only one lymph node area or in only one area or organ outside the lymph nodes. In Stage II (locally advanced disease), lymphoma is found in two or more lymph nodes on the same side of the diaphragm or the lymphoma extends from a single lymph node or single group of lymph nodes into a nearby organ. In Stage III (advanced disease), lymphoma is found in lymph node areas on above and below the diaphragm. Lymphoma may have also spread into areas or organs adjacent to lymph nodes, such as the spleen. In Stage IV (widespread disease), the lymphoma has spread (metastasized) via the bloodstream to organs outside the lymph system, such as the bone marrow, brain, skin, or liver. In early stages of lymphoma, providers may recommend watchful waiting where treatment is delayed until symptoms appear or worsen. Treatment for lymphomas generally uses chemotherapy (particularly intensive regimens using several drugs) or a combination of chemotherapy and radiation. Monoclonal antibody biologic drugs, which are now being used more frequently in combination with chemotherapy drugs, were the first type of immunotherapy. A more recent immunotherapy approach called CAR-T involves the person's own T-cells genetically modified to attack cancer cells. Transplantation is mainly used to treat people who relapse. Surgery is not a usual treatment option. People may also wish to consider enrolling in a clinical trial that tests new and experimental drugs or treatments. Click the icon to see a series detailing bone marrow transplant.
. A complete response, for example, means that there is no longer any evidence of the disease by examination, blood tests, or x-ray studies. It does not necessarily mean that the disease is cured. It may still recur later on. Imaging such as CT scans, MRI scans, or a PET may be done after a course of chemotherapy. At times, a PET scan may be done after just 1 to 3 cycles of chemotherapy (but before the full course of chemotherapy is completed) to assess if it appears there is a response. A change in the chemotherapy regimen may be instituted if it does not appear the tumor is improving after the PET scan. In judging the success of a treatment for NHL, the most important criteria are overall survival and the duration of time until the disease progresses or the person dies. therapy because the drugs travel throughout the bloodstream to the entire body. Chemotherapy may also be used along with radiation. A chemotherapy cycle is usually 21 to 28 days. People take the drugs for a few days, then have a period of rest. The drugs may be taken as pills at home or given by injection or infusion in a medical center or doctor's office. Chemotherapy is injected into the spinal fluid if the cancer has spread to the brain. This approach is called intrathecal chemotherapy. Intrathecal chemotherapy is also used as a preventive measure in people at high risk for central nervous system involvement. Some people receiving chemotherapy need to remain in the hospital for several days so the effects of the drug can be monitored. A current standard chemotherapy regimen for NHL is CHOP. CHOP is a combination of cyclophosphamide, doxorubicin hydrochloride (Adriamycin), vincristine (Oncovin), and prednisone. It is particularly effective for many stages of lymphoma when used in combination with rituximab (Rituxan), a biologic drug. (See Biologic Therapy section of this report.) Some studies of this combination in low-grade lymphomas have reported response rates of 70% to 100%. Bendamustine (Treanda, Bendeka) has been replacing CHOP in the management of low grade lymphomas. It is often used in combination with rituximab. Fludarabine (Fludara) is a type of drug called a nucleoside analogue. It is one of the most used drugs for treating low-grade lymphomas. Fludarabine is often used in a chemotherapy regimen called FCR (fludarabine, cyclophosphamide, and rituximab). Other fludarabine regimens for follicular and low-grade lymphomas are FAD (fludarabine, adriamycin, and dexamethasone) and FND (fludarabine, mitoxantrone, and dexamethasone). Etoposide is another cancer drug that is sometimes used in a regimen called EPOCH (etoposide, prednisone, vincristine, cyclophosphamide, and doxorubicin.) EPOCH may be used in combination with rituximab. Side effects and complications of any chemotherapeutic regimen are common. They are more severe with higher doses. Side effects may increase over the course of treatment. Radiation treatment may worsen chemotherapy side effects. Nausea and vomiting. Drugs known as serotonin antagonists, such as ondansetron (Zofran) or granisetron (Kytril), can relieve these side effects. These side effects are nearly always temporary. Most people are able to continue with normal activities for all but perhaps a few days a month. Anemia, a lack of red blood cells. Erythropoietin stimulates red blood cell (hemoglobin) production and can help reduce or prevent this side effect. It is available as epoetin alfa (Epogen, Procrit) and darbepoetin alfa (Aranesp). In people with cancer, these drugs should be used to treat only severe anemia associated with chemotherapy and to maintain hemoglobin levels at 10 g/dL. Treatment should stop as soon as chemotherapy is complete. These drugs may not be safe or appropriate for all people. Fatigue is very common after chemotherapy and may last for several years. Bladder cancer is associated with certain types of chemotherapy drugs used for NHL. Infertility is a risk, particularly with the use of cyclophosphamide. Heart failure risk increases with regimens containing certain drugs, particularly doxorubicin or mitoxantrone. Osteoporosis (bone thinning) and increased risk for fracture may occur in people treated with steroid drugs such as prednisone. In general, these serious late side effects depend on the type of drug used and cumulative drug dose. Biological response modifier therapy, also called immunotherapy, uses the body's own immune system to fight cancer. These biologic drugs are often combined with other treatments. MAbs are the main drugs used in biologic therapy. MAbs are designed in the laboratory to mimic the body's natural antibodies and attack specific antigens (foreign substances) produced by the cancer. Lymphomas carry antigens that provoke strong immune responses and so are particularly good candidates for MAb therapy. CAR-T is a newer type of immunotherapy, also called adoptive cell transfer, which uses the patient's own T-cells as drugs targeting cancerous B-cells. Rituximab (Rituxan) was the first monoclonal antibody approved for cancer. This drug targets the CD-20 antigen, which is found on most B-cell lymphomas. It is the most commonly used biologic drug, particularly in combination with standard chemotherapy regimens. Rituximab is used to treat many types of CD20-positive tumors. Rituximab is used as a single drug or in combination with chemotherapy for low-grade or FL. It is also used in combination with other drugs for other types and stages of lymphomas including diffuse large B-cell (DLBC). Rituximab in combination with CHOP (a regimen called R-CHOP, or CHOP-R) is used for first-line treatment of aggressive lymphomas. Rituximab is given by infusion. The treatment has mild-to-moderate short-term side effects, including nausea, fever, chills, hives, dizziness, and headache. Uncommon and more serious side effects are severe allergic reactions, very low blood pressure, blood abnormalities, wheezing, infections, and sudden heart events. People who have previously had hepatitis B, or who are at high-risk for this viral infection, should be tested before taking rituximab because the drug has been linked to reactivation of the hepatitis B virus. People who are HIV-positive may experience more adverse effects from rituximab than with CHOP alone. Some newer MAbs are used to treat NHL by attaching radioactive molecules to them. When the drug is injected, the monoclonal antibody targets an antigen (protein) on the surface of the tumor. The radioisotope is then delivered directly into the tumor where it kills the cancer. Ibritumomab targets the CD-20 antigen. Treatment takes about 7 to 9 days to complete, compared to several months for traditional chemotherapy treatments. Ibritumomab (Zevalin) is approved for patients with relapsed or refractory low-grade, follicular or transformed B-cell NHL, and for patients with follicular NHL who have not responded to rituximab (Rituxan). It has been safely used for patients with advanced NHL who have had stem cell transplantation. In general, these drugs cause fewer side effects than traditional chemotherapy. However, serious complications may include skin infections, severe allergic reactions, and temporary lowering of blood counts. Due to the radioisotope component, these drugs are also more difficult to administer than rituximab. They tend to be used if people do not respond to rituximab. CAR-T cell therapy has recently become available as a treatment option for certain types of NHL. CAR-T involves using the body's own T-cells. These cells are separated from a sample of the person's blood and genetically modified. As a result, they express a specific receptor (chimeric antigen receptor, or CAR). This receptor recognizes a matching molecule on the cancerous B-cells. These CAR-T cells are then multiplied and infused back into the person where they target and kill the cancerous cells. Both of these therapies target the CD19 antigen and are approved to treat certain types of B-cell NHL. These include DLBCL, primary mediastinal large B-cell lymphoma, and high-grade NHL. People whose disease relapsed or did not improve after at least two other types of treatments may receive this new treatment. Serious side effects are possible following CAR-T cell therapy. These include high fever, low blood pressure, as well as toxic effects on the brain, and serious infections resulted from a weakened immune system. Due to the promising results obtained so far, the CAR-T therapy field is rapidly evolving and more adoptive cell transfer treatment strategies are expected in the near future. Bortezomib (Velcade) is a proteasome inhibitor drug. It is approved for people who have received at least one prior therapy. Lenalidomide (Revlimid) is the first and only oral therapy for mantle cell lymphoma. It was approved for people whose disease has relapsed or progressed after two prior therapies, one of which included bortezomib. Lenalidomide is chemically related to thalidomide, a drug which can cause severe birth defects. Ibrutinib (Imbruvica) was approved for people who have received at least one prior therapy. The drug received accelerated FDA approval and a "breakthrough therapy" designation based on its success in improving person outcomes in clinical trials. Radiation therapy uses high energy x-rays to kill cancer cells and shrink tumors. It may also be used as palliative therapy to relieve symptoms in advanced cancer. Radiation may be used as the sole therapy for some early-stage (I or II) lymphomas, or may be used along with chemotherapy for later-stage (III or IV) lymphomas.
) and sometimes to lymph nodes in the upper abdomen or spleen or both. may be used, which is directed to other regions, including lymph nodes in the upper abdomen, spleen, and pelvis, in addition to the mantle-field. is given just to the lymph nodes involved with lymphoma. may sometimes be performed before stem cell transplant to eliminate any remaining cancer cells that were not destroyed by chemotherapy. Fatigue, nausea, diarrhea, dry mouth, skin irritation, and increased risk for infections are common short-term side effects of radiation therapy. These side effects generally clear up after treatment is completed. Chest radiation can lead to lung damage and difficulty breathing. Chest radiation may also increase the long-term risk for heart disease, heart attack, and lung cancer. Although rare, the development of breast cancer is a particular concern for young women and adolescent girls treated with chest radiation. 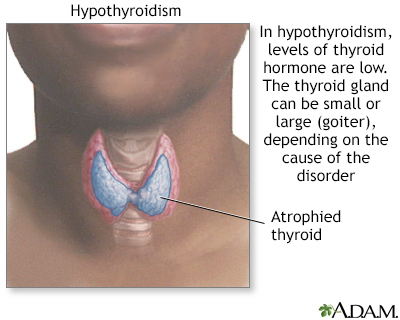 Neck radiation may increase the later risk for underactive thyroid (hypothyroidism) and thyroid cancer. Radiation to the pelvic area may increase the risk for infertility, particularly for women. 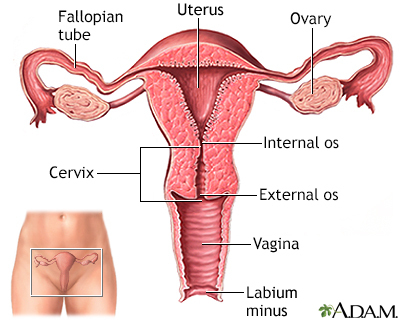 A procedure called ovarian transposition may be used to surgically move the ovaries away from the path of radiation. , which are produced in the bone marrow. Stem cells are the early forms for all blood cells in the body. Transplantation is usually reserved for people with relapsed aggressive NHL or people whose lymphoma is in remission but is likely to return. Stem cell transplantation usually follows an intensive regimen of high-dose chemotherapy, which is sometimes given along with radiation. The goal of the high-dose chemotherapy is to destroy as many cancer cells as possible, including cancer cells that have been resistant to standard-dose treatment. However, high-dose chemotherapy also destroys bone marrow and the stem cells it contains. Transplantation allows for the reintroduction of healthy blood-forming stem cells. PBSCT is the most commonly performed type of stem cell transplantation. In an autologous transplant, the marrow or blood cells used for replacement are taken from the patient. Autologous transplants are the most common type of transplant used for lymphoma. However, if the cancer has spread to the blood or bone marrow, there is some danger that these cells may contain tumor cells, and that the cancer can regrow. In an allogeneic transplant, bone marrow or stem cells are taken from a donor. Siblings are the best donors. Only about 25% of transplants for NHL are the allogeneic type. Allogeneic transplants have increased risks for serious side effects and complications. Older people who cannot tolerate the preparatory treatment required for a standard allogeneic transplant may be able to receive a non-myeloablative transplant ("mini-transplant"), which uses lower doses of chemotherapy and radiation. The donor is usually given a drug called granulocyte colony-stimulating factor, or G-CSF (filgrastim, lenograstim, pegfilgrastim) to stimulate stem cell growth. The person (or donor in an allogeneic procedure) then undergoes apheresis. With this process the blood is withdrawn from one of the person's veins, then passes through a machine that filters out the white cells and platelets, which contain the stem cells. The blood is returned through another vein. The entire procedure takes 3 to 4 hours but needs to be repeated several times. The stem cells are treated to remove contaminants and then are frozen to keep them alive until the person is ready to receive them. Blood transports oxygen and nutrients to body tissues and returns waste and carbon dioxide. Blood also distributes nearly everything that is carried from one area in the body to another place within the body. For instance, blood helps transport hormones from the endocrine organs to their target organs. Blood also helps maintain body temperature. The protective functions of blood include clot formation and the prevention of infection. Stem cell transplants are preceded by chemotherapy treatment known as conditioning. The goal of this treatment is to inactivate the immune system and to kill any residual malignant cells. It is extremely toxic since it also destroys non-malignant marrow cells. A few days after treatment, the person is given the stored stem cells, which are administered through a vein. This may take several hours. People may have a fever, chills, hives, shortness of breath, or a fall in blood pressure during the procedure. The person may be treated with granulocyte colony-stimulating factor after chemotherapy. The goal is to stimulate the growth of infection-fighting white blood cells. The person is kept in a protected environment to minimize infection. People who have received an allogeneic transplant may need blood cell replacement, nutritional support, and drugs to treat graft-versus host disease. They can usually leave the hospital within 3 to 5 weeks. Early side effects of transplantation are similar to chemotherapy and include nausea, vomiting, fatigue, mouth sores, and loss of appetite. 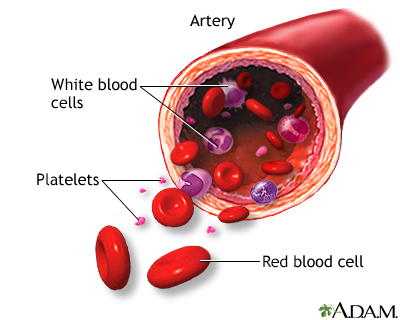 Bleeding due to reduced platelets is a high risk during the first 4 weeks. Later side effects include fertility problems (if the ovaries are affected), thyroid gland problems (which can affect metabolism), lung damage (which can cause breathing problems) and bone damage. In younger people, there is a small long-term risk for development of secondary cancers such as leukemia. Two of the most serious complications of transplantation are infection and graft-versus-host disease (GVHD). resulting from a weakened immune system is the most common danger. The risk for infection is most critical during the first 6 weeks following the transplant, but it takes 6 to 12 months post-transplant for a person's immune system to recover. Many people develop severe herpes zoster virus infections (shingles) or have a recurrence of herpes simplex virus infections (cold sores and genital herpes). 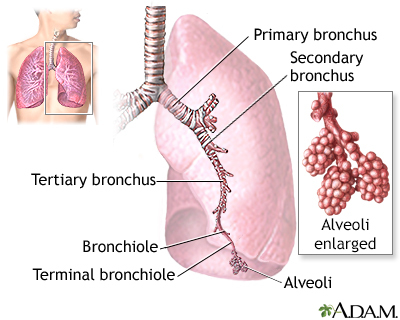 Pneumonia, and infection with germs that normally do not cause serious infections such as cytomegalovirus, aspergillus (a type of fungus), and Pneumocystis jiroveci (a fungus) are among the most important life-threatening infections. where the immune system kills remaining lymphoma cells. Still, severe GVHD can pose serious complications. occurs in 30% to 50% of allogeneic transplants, usually within 25 days. Its severity ranges from very mild symptoms to a life-threatening condition (more often in older people). The first sign of acute GVHD is a rash, which typically develops on the palms of hands and soles of feet and can then spread to the rest of the body. Other symptoms may include nausea, vomiting, stomach cramps, diarrhea, loss of appetite and jaundice (yellowing of skin and eyes). To prevent acute GVHD, doctors give people immune-suppressing drugs such as steroids, methotrexate, cyclosporine, tacrolimus, and MAbs. Too much sun exposure can trigger GVHD. Be sure to always wear sunscreen (SPF 15 or higher) on areas of the skin that are exposed to the sun. Stay in the shade when you go outside. Discuss with your doctor what vaccinations you need and when you should get them. Avoid crowds, particularly during cold and flu season. Avoid eating raw fruits and vegetables -- food should be well cooked. Do not eat foods purchased at salad bars or buffets. In the first few months after the transplant, be sure to eat protein-rich foods to help restore muscle mass and repair cell damage caused by chemotherapy and radiation. Report to your doctor any symptoms of fever, chills, cough, difficulty breathing, rash or changes in skin, and severe diarrhea or vomiting. Fever is one of the first signs of infection. Some of these symptoms can also indicate graft-versus-host disease. Armitage JO, Gascoyne RD, Lunning MA, Cavalli F. Non-Hodgkin lymphoma. Lancet. 2017;390(10091):298-310. PMID: 28153383 www.ncbi.nlm.nih.gov/pubmed/28153383. Baden LR, Swaminathan S, Angarone M, et al. Prevention and treatment of cancer-related infections, Version 2.2016, NCCN Clinical Practice Guidelines in Oncology. J Natl Compr Canc Netw. 2016;14(7):882-913. PMID:27407129 www.ncbi.nlm.nih.gov/pubmed/27407129. Brudno JN, Kochenderfer JN. Chimeric antigen receptor T-cell therapies for lymphoma. Nat Rev Clin Oncol. 2018;15(1):31-46. PMID: 28857075 www.ncbi.nlm.nih.gov/pubmed/28857075. Dreyling M, Ghielmini M, Marcus R, Salles G, Vitolo U; ESMO Guidelines Working Group. Newly diagnosed and relapsed follicular lymphoma: ESMO Clinical Practice Guidelines for diagnosis, treatment and follow-up. Ann Oncol. 2011;22 Suppl 6:vi59-vi63. PMID: 21908506 www.ncbi.nlm.nih.gov/pubmed/21908506. Ghobadi A. Chimeric antigen receptor T cell therapy for non-Hodgkin lymphoma. Curr Res Transl Med. 2018;66(2):43-49. PMID: 29655961 www.ncbi.nlm.nih.gov/pubmed/29655961. Hochberg J, Giulino-Roth L, Cairo MS. Lymphoma. In: Kliegman RM, Stanton BF, St. Geme JW, Schor NF, eds. Nelson Textbook of Pediatrics. 20th ed. Philadelphia, PA: Elsevier; 2016:chap 496. Huang MS, Weinstein H. Non-Hodgkin lymphoma. In: Lanzkowsky P, Lipton JM, Fish JD, eds. Manual of Pediatric Hematology and Oncology. 6th ed. Philadelphia, PA: Elsevier; 2016:chap 22. Lenz G, Staudt LM. Aggressive lymphomas. N Engl J Med. 2010;362(15):1417-1429. PMID: 20393178 www.ncbi.nlm.nih.gov/pubmed/20393178. National Comprehensive Cancer Network website. NCCN guidelines for patients. Non-Hodgkin's lymphomas. www.nccn.org/patients/guidelines/cancers.aspx#nhl. Accessed November 16, 2018. PDQ Adult Treatment Editorial Board. Adult Non-Hodgkin lymphoma treatment (PDQ®): health professional version. PDQ Cancer Information Summaries [Internet]. Bethesda (MD): National Cancer Institute (US); 2002-2018. PMID: 26389492 www.ncbi.nlm.nih.gov/pubmed/26389492. PDQ Pediatric Treatment Editorial Board. Childhood Non-Hodgkin lymphoma treatment (PDQ®): health professional version. PDQ Cancer Information Summaries [Internet]. Bethesda (MD): National Cancer Institute (US); 2002-2018 Aug 22. PMID: 26389181 www.ncbi.nlm.nih.gov/pubmed/26389181. Roschewski MJ, Wilson WH. Non-hodgkin lymphoma. In: Niederhuber JE, Armitage JO, Doroshow JH, Kastan MB, Tepper JE, eds. Abeloff's Clinical Oncology. 5th ed. Philadelphia, PA: Elsevier Saunders; 2014:chap 106. Sandlund JT, Onciu M. Childhood lymphoma. In: Niederhuber JE, Armitage JO, Doroshow JH, Kastan MB, Tepper JE, eds. Abeloff's Clinical Oncology. 5th ed. Philadelphia, PA: Elsevier Saunders; 2014:chap 97. Wang T-F, Bartlett NL. Lymphomas of the head and neck. In: Flint PW, Haughey BH, Lund VJ, et al, eds. Cummings Otolaryngology: Head and Neck Surgery. 6th ed. Philadelphia PA: Elsevier Saunders; 2015:chap 117. Reviewed By: Todd Gersten, MD, Hematology/Oncology, Florida Cancer Specialists & Research Institute, Wellington, FL. Review provided by VeriMed Healthcare Network. Also reviewed by David Zieve, MD, MHA, Medical Director, Brenda Conaway, Editorial Director, and the A.D.A.M. Editorial team. Editorial update 11/16/2018.